Protection, balance, stimulates the brain, detoxifies, helps with cramps, nausea, vomiting, menstrual problems, eases labor, calming. This beautiful green gemstone is referred to as the “Stone of Loyalty”. Malachite boosts inner peace and hope and is associated with growth and abundance. It reveals sub-conscious blocks and apart from its healing properties, is one of the most important crystals for protection. Good for circulation problems. Malachite is one of the master healer stones. It opens the heart to unconditional love. It can, according to Shamans, make a man invisible, and drinking from the malachite cup understands the language of animals. In India it is believed that malachite, superimposed on the chakra of the third eye, helps to purify the consciousness of resentments and anxieties. 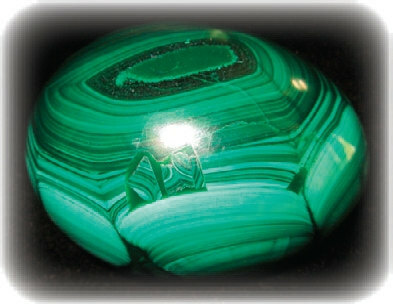 In Russia, Malachite was considered a symbol of fulfillment. Many nations believed malachite was the “stone of health”. Put on the solar plexus, malachite relieves emotional tension, creates a balance of energy between chakras. Absorbs negative energy. According to some American healers it guards against radiation and clears electromagnetic pollution, promotes tissue regeneration and has a beneficial effect on the nervous system.